Create a magical wedding theme inspired by glitter, ice and snow. 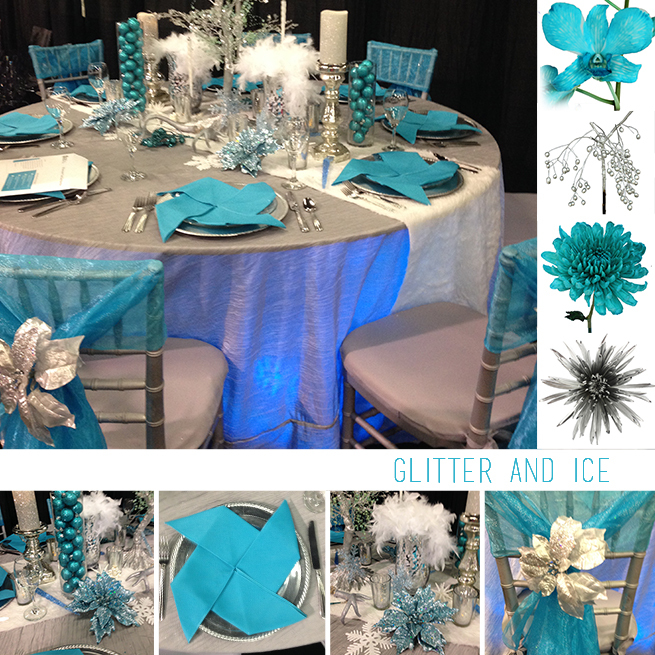 Winter is the perfect inspiration for your teal centerpieces and a silvery, snowflake wedding theme! We love so many elements about this tabletop. First notice the blue light effect shining from underneath the table and through the silvery linen creating a flow effect to illuminate the room. And the snowflake-inspired napkin fold adds the shapes of winter to each place setting. Check out this tutorial for step by step instructions. The cylinders filled with sparkly teal ornaments and fluffy, white feathers create dynamic texture and interest. And together these elements evoke the excitement of a chilly and gorgeous winter day with the perfect balance of sparkle and color. This wedding theme idea was recently shared with Event Pros at The Special Event convention. Special thanks to the talented team at Creative Creations Omaha who styled this stunning scene. Want to explore Flowers By Color? Shop 50+ colors of flowers including True Blue, Teal Blue, Baby Blue and Silver.